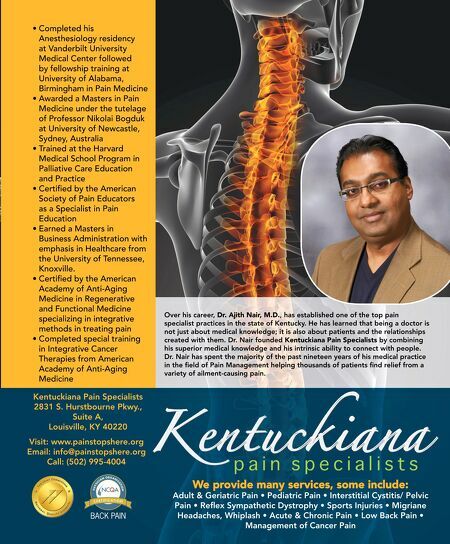 88 LOUISVILLE MAGAZINE 8.14 Special Advertising Section Te new Kentuckiana Oral and Maxillofacial Surgery Associates (KOMSA) state-of-the-art facility at 2800 Cannons Lane opened in early March. As a result, once-dreaded dental procedures may no longer be described in a "pulling teeth" sort of way. Soon, a frst-of-its- kind surgicenter for our region will open within the new facility, bringing together the best dentists of the region to provide interdisciplinary patient care. Patients with dental phobias can be anesthetized at a deeper level and KOMSA will continue its decade-long tradition of ofering great patient care by utilizing the specialty skills of members from the dental community. Te new facility is multi-purposed with one foor devoted to an education suite where doctors from around the world will come together for advanced training. Another foor houses the region-exclusive surgicenter where maxillofacial surgeries like reconstructing facial bones to allow patients to feel better and eat, chew and smile normally can be performed in Kentuckiana Oral & Maxillofacial Surgery Associates taking dread out of dental procedures at new location cost-and time-efcient ways by teams of dentists, surgeons and specialty doctors. By focusing on health and wellness of the entire mouth, jaw, and face, the KOMSA doctors perform techniques designed to rebuild bone structure with minimal surgical intervention. Te group diagnoses and treats facial pain, facial injuries and fractures. Tey ofer post- trauma reconstruction of the face and surgical procedures to correct congenital deformities and failed reconstructions. In addition, the group performs dental implant placement as well as extraction of teeth, including wisdom teeth. KOMSA recently welcomed their sixth doctor: Will Allen. Originally from Richmond, Ky, Dr. Allen's special interest is reconstructive facial procedures. Kentuckiana Oral & Maxillofacial Surgery Associates, PSC; Downtown, (502) 587-7874; Springhurst, (502) 326-0606; or Mount Washington, (502) 957-1250. Visit www.KOMSA.com. Wear sunscreen, a hat and sunglasses that block 100% of UVB and UVA rays. 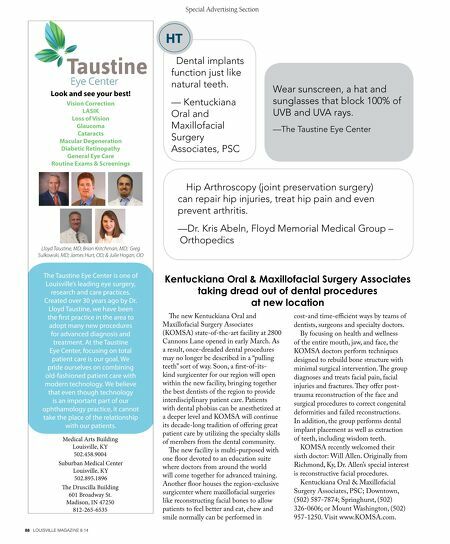 —The Taustine Eye Center Hip Arthroscopy (joint preservation surgery) can repair hip injuries, treat hip pain and even prevent arthritis. —Dr. Kris Abeln, Floyd Memorial Medical Group – Orthopedics Dental implants function just like natural teeth. — Kentuckiana Oral and Maxillofacial Surgery Associates, PSC HT Vision Correction LASIK Loss of Vision Glaucoma Cataracts Macular Degeneration Diabetic Retinopathy General Eye Care Routine Exams & Screenings Lloyd Taustine, MD; Brian Kritchman, MD; Greg Sulkowski, MD; James Hurt, OD; & Julie Hogan, OD The Taustine Eye Center is one of Louisville's leading eye surgery, research and care practices. Created over 30 years ago by Dr. Lloyd Taustine, we have been the frst practice in the area to adopt many new procedures for advanced diagnosis and treatment. At the Taustine Eye Center, focusing on total patient care is our goal. We pride ourselves on combining old-fashioned patient care with modern technology. We believe that even though technology is an important part of our ophthamology practice, it cannot take the place of the relationship with our patients. Medical Arts Building Louisville, KY 502.458.9004 Suburban Medical Center Louisville, KY 502.895.1896 Te Druscilla Building 601 Broadway St. Madison, IN 47250 812-265-6535 Look and see your best!